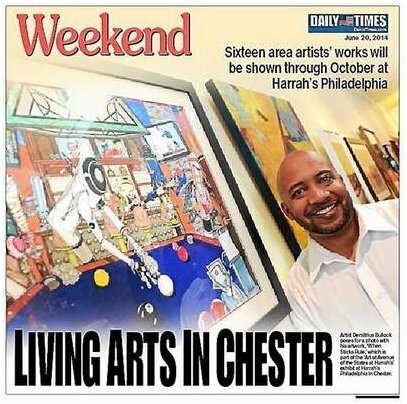 CHESTER - The path to a role reversal of pool sticks and people that can be seen in a casino lobby started with a TV Guide challenge to draw a turtle and was eased along by some spousal support as artist Demitrius Bullock reveled in his work one recent Friday. After his wife, Michelle, prodded him to enter, Bullock entered his "When Sticks Rule" and was selected to show it in the "Art at Avenue of the States at Harrah's" exhibit hanging in the lobby of Harrah's Philadelphia through the end of October. "My wife said, 'Put it in, put it in,'" Bullock said, adding he thought his work would fit the environment well. "I thought it would be a wonderful complement." Linda Braceland, director of the Art on Avenue of the States gallery, said about 60 works were submitted for the exhibit and 16 were chosen in the gallery's third showing at the gaming center. "This keeps them honest," Braceland kidded about what's displayed on the walls. "This keeps them fresh. It's not some static thing. It works for them. It works for us." Braceland took the photograph, "Sunrise Over the Commodore Barry," which is seen in the show. To take it, she arrived along the Delaware River between the wharf and PPL Park at 6 a.m. in September. "It's like a split second you get these kinds of shots," she said. "The reason I like this piece (is) because I was able to catch the reflection of the sun on the bridge." Braceland explained that the casino atmosphere was considered in the piece selection. "You try to do things appropriate for here," she said. That's one thing exhibit visitor Shelley Ashfield liked about Bullock's image-dense work. "It captures the craziness you see in a casino," said Ashfield, a Havertown resident. "Demitrius combines craftsmanship and humor and it's great to see." Alan Soffer, one of the show's jurors, said he wanted to make certain the selections were diverse. They include photography, collage, abstract, watercolors and mixed media. "It simply has to accomplish three things in my book," he said of tho works that were chosen. "It has to have great color. It has to have great composition. Thirdly, it has to have a concept." Art also represents a sharing at a very deep level, as Soffer spoke to the artists, recognizing the space where they create these works. "In this day and age, when life is so hectic," he said, "you need a sacred space. We appreciate you sharing your sacred space with us." Artist Lois Schlachter, whose "Corner Pocket" simulates a colorful array of pool balls and sticks, said she was very grateful to have the opportunity to expose her work to the public. "Each painting is like your child, and you're sending it out," she said. "You put it up there and say, 'Good luck." She said her "Corner Pocket" was an exercise in comfort. "It was just something that came about," Schlachter said. "I want you to be comfortable. I want the figures to be comfortable in the space that they're occupying." Patricia Wilson-Schmid based her "Heeling" oil painting of a sailboat through shards of shapes on a trip she took to Fallingwater, the Frank Lloyd Wright masterpiece nestled within the lush, wooded Bear Run Nature Reserve in Pennsylvania's Laurel Highlands. "I saw all these verticals and horizontals, and I said, 'I'm going to do something with that,'" she said. Bullock said his "When Sticks Rule" was part of his "Imagine This" series that features robots playing instruments and in this case, pool sticks changing places with people in a mixed media creation. Although he began in earnest six to seven years ago with his art, he said his passion was evident as a child as he flipped through the TV Guide and was drawn to the drawing exercise. He recalled seeing the section stating that if he could draw a particular turtle, he could be an artist. He did and he said his drawing won the contest. Now he uses watercolors, pens, markers and airbrushes to create the effect he wants. "I love when people look at my work and say, 'Oh, look at that,'" he said. "I always hide something in there." But, the best part, he said, is having the chance to share his passion with others. "I just like the idea of people being able to see it," Bullock said. "Art at Avenue of the States at Harrah's" will be on display in ground floor lobby of Harrah's Philadelphia Racetrack & Casino at 777 Harrah's Blvd. in Chester through the end of the fall. Artist LOIS SCHLACHTER of SPRING MOUNT, PENNSYLVANIA has received FOUR Special Recognition Awards in the "16th Annual Contemporary Art Juried Online International Art Exhibition" hosted by Upstream People Gallery. This exhibition will be featured online at www.upstreampeoplegallery.com during June 2014 and continue until June 2015. This international exhibition received approximately 220 art entries from around the world and 43 artists were selected by the juror Laurence Bradshaw, Professor of Art at the University of Nebraska at Omaha, U. S. A. "LOIS SCHLACHTER of Spring Mount, Pennsylvania is certainly a favorite. 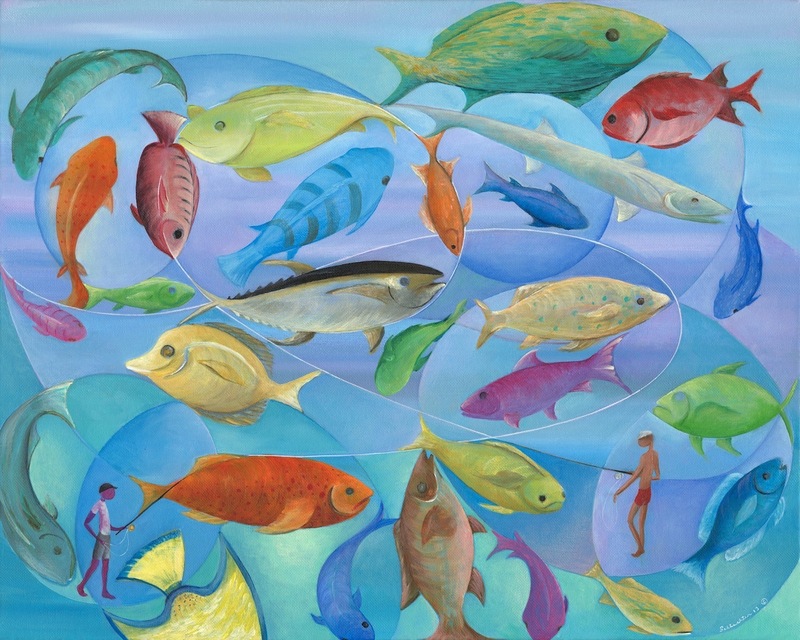 The sense of composition and color is tremendous in the work "Bathing Beauties" - such a quality work playing on the idea using multi-colored fish as bathing beauties. 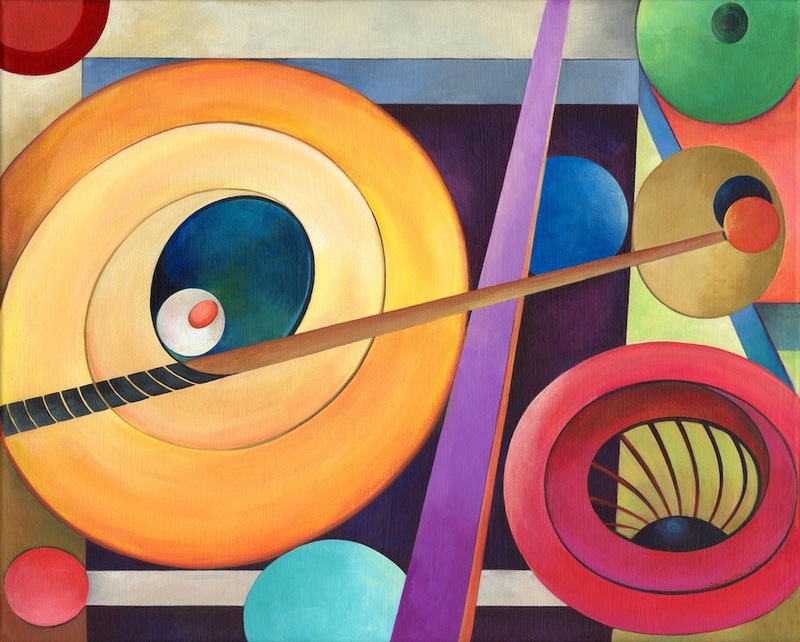 "Corner Pocket" is curious in the sense of the several circular areas, yet the aim is rather focused at the one pocket in the game of pool - the colors are delightful. 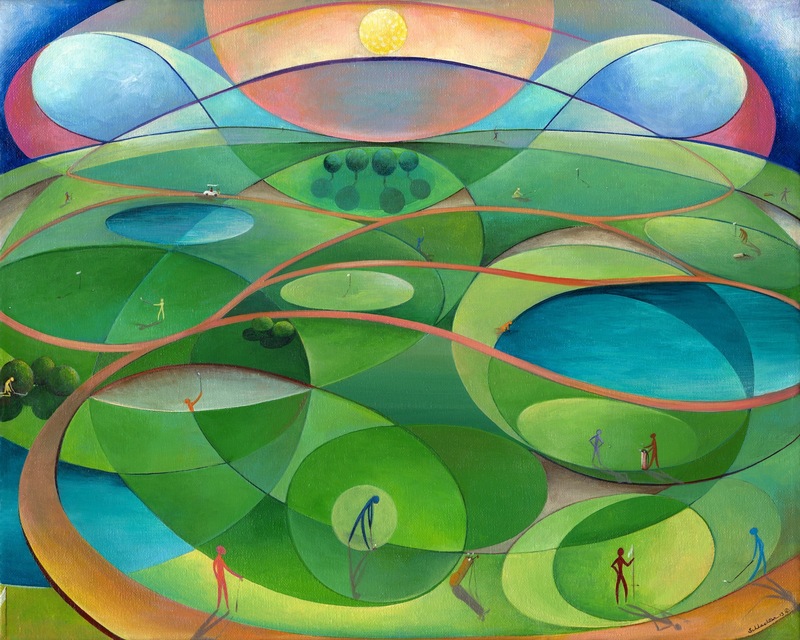 Her concept of "Golf" with the abundant green and the swirls that are suggestive of the golf swing, is all well conceived. 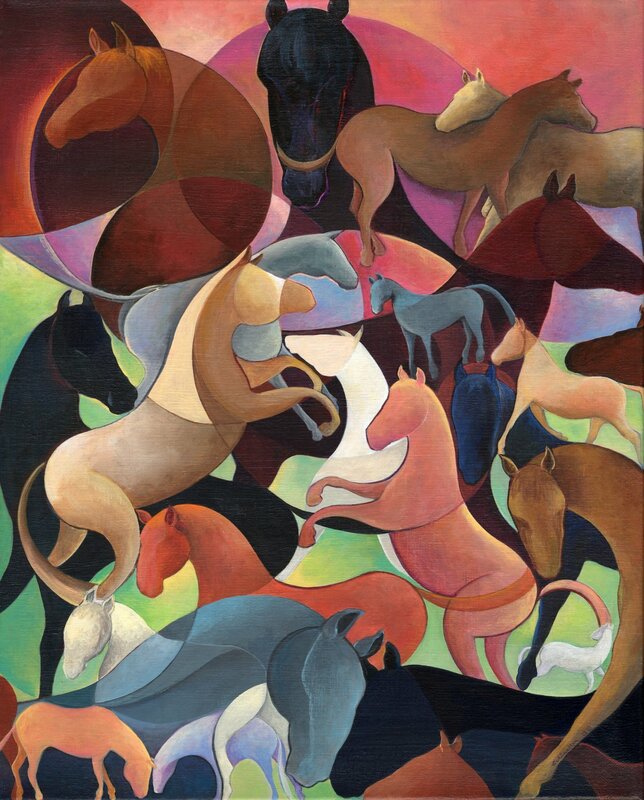 And the strong tonal contrast and the interplay of the horse motif well titled "Horse Play" is another fine work." The Philadelphia Tri-State Artists Equity is a regional, nonprofit art advocacy instituted to promote professional standards and practices or the working artist. The organization has been in operation since 1949 and, among other issues, has made significant advances in artists' health, fair guidelines for exhibitions and sponsorship for art education. An expansive exhibition of its members' work, simply titled "Artists Equity," is on display through March 3 at the GoggleWorks Center for the Arts. At least 60 medium-to-small-sized artworks occupy the entire first floor, filling both sides of the Cohen Gallery. The exhibit itself, however, is one more example of a group or members' show that is no different, no better, no worse than any other show, juried or not, that passes through the GoggleWorks doors. Many of the artworks, in my opinion, follow and repeat the same old safe methodologies and procedures to offer very little excitement or interest. There are, however, good works in the show, and it is not surprising that these works are visionary, inventive and a tad subversive. I suppose it should be stated, too, that this is a members' show with nothing said of a selective process, so I will mention a few of the notable artworks. 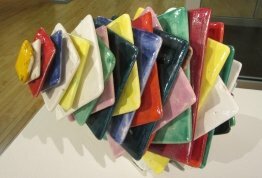 I was especially drawn to a tabletop ceramic titled "Terpsichore #6" by John Costanza. The artist has joined brightly hued ceramic tiles of increasing and decreasing size to build a multifaceted polygon that sits sideways on a pedestal. A totally realized and colorful work, the piece is an unavoidable eyecatcher and one of the best in the show. The same can be said of a wall sculpture by Cynthia Minsk titled "Breaking Point," in which a combined painting/object curves over the viewer like a great blue tidal wave. A larger oil painting by Elaine Bass, titled "46th and Broadway," is interesting for its lower center of visual gravity, as if Radio City Music Hall was being seen from a child's point of view. A late-in-the-day holiday narrative, it depicts a cluster of people crossing the street in front of the New York City landmark amid traffic. The forms are simplified and offer a stylized interpretation of metropolitan living. I did get a chuckle out of Joe Szimhart's "Yellow Riders," an expressionist oil painting of two egrets standing placidly on the back of a crocodile. 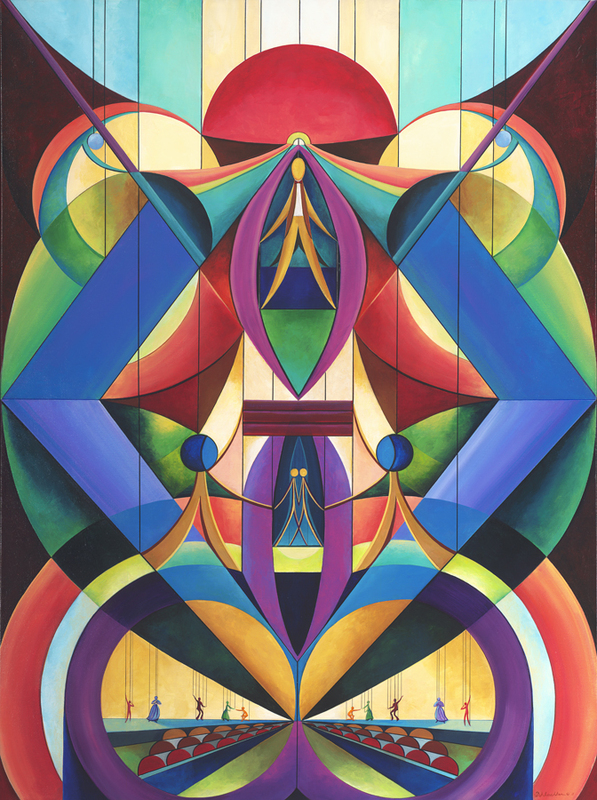 An exquisite acrylic painting by Lois Schlachter called "Marionette Theater" depicts a symmetric and visionary composition of diamond shapes mingled with images of marionettes performing on a mirrored stage. A batik on wool, "Taking a Nap" by Laura Pritchard, shows a naked woman on her side in an Arcadian setting with stick figures playing in the background. The theme of Arcadia seems to be showing up more often, I've noticed. Naturally, the installation looks great, and the GoggleWorks staff made for an attractive and easily navigable setup. Overall, the Philadelphia Tri-State Artists Equity does wonderful things for both artists and the arts community and deserves support, but this show was spotty at best and not one of its better presentations.